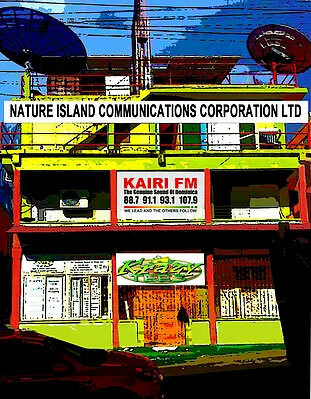 Kairi FM started broadcasting on November 14 1994 on Old Street in the capital city of Roseau on two frequencies of 107.9 and 93.1 Three years later the station moved to a bigger building in the city as the first building had become too small and business continued to grow rapidly within the organization . The business was operated by shareholders from 1994 to 2000. In 2001 the main shareholder, former US police officer and current businessman Frankie Bellot bought over the entire company and then moved to his personal property on Independence Street from where the business now operates on the assigned frequencies of 107.9, 93.1.91.1 and 88.7 FM. We continue to be proud of our leading role in the Media broadcast domain on assigned FM frequencies 93.1, 107.9, 88.7 and music frequency 91.1 for music lovers. Our 107.9 signal is also heard in Guadeloupe, Antigua, St Kitts, and newest station KAIRI FM St Lucia. That right!! In 2014 Kairim FM St Lucia was launched and has taken the St Lucian market by storm. Linked with our local fequency 91.1 listeners from both countries are able to link and enjoy the programming of both Kairi FM Dominica and St Lucia. Advertisers are also able to take advantage of directly reaching these two markets simultaneously. We are proud to boast that we are the only radio station to provide this service. We are the only station in Dominica which is controlled remotely by an efficient team to ensure the station remains on the air 24 hours daily.